On yesterday, an overpacked ferry transporting nearly 200 people across the Tigris River capsized in Mosul, Iraq’s northern city, killing over 100 people, predominantly women and children. An additional fifty people remain missing at present. Family and community members are grappling with the pieces of this devastation that include securing the best routes to justice and transport safety regulations, particularly since the capacity of the ferry was 50 people. Over the last few years, Mosul has been in the arduous process of rebuilding from long-term militarized conflict. March 21st not only marks Mother’s Day in Iraq but also the Naw-Rúz festival, a holiday time celebrated by millions of people worldwide, marking the beginning of Spring and a time of renewal, as well as the celebration of new life and good fortune in the year to come. 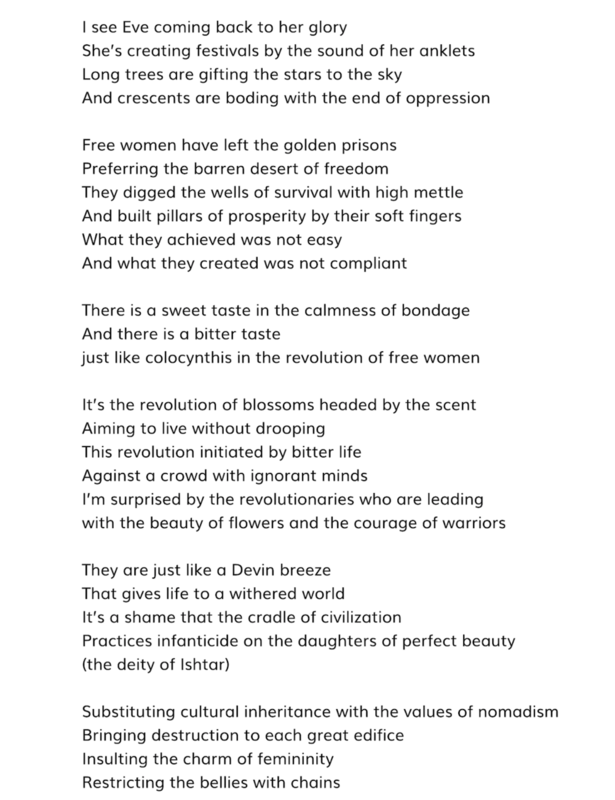 In honor of Womxn’s History Month and the lives lost in Mosul, we share a poetic tribute by MAFAZ AL-DIZDAR, a women’s rights activist in Iraq and a Caux Scholars Program-Asia Plateau alumna (2018-19). Mafaz’ poem, written in both Arabic and English below, was also published this month in an Iraqi newspaper. Citrus blossom is the flowering fruit in Iraq that signifies the Spring season. MAFAZ AL-DIZDAR is a 29 year old women’s right activist from Baghdad, Iraq and an alumna of the Caux Scholars Program-Asia Plateau (2018-19). She graduated from the University of Technology with a degree in Chemical Engineering in 2012. She currently works as an Administrative Officer for Relief International. Mafaz is passionate about advocating for women’s rights and has been writing essays and poetry since 2016. Through the sincerity of words, Mafaz believes the attitudes and behaviors of human beings can be provoked encouragingly to embrace different perspectives.